Prokofieff traces the three stages of heavenly preparation of anthroposophy: the 'spiritual thunderstorm', the Michael School in the Sun sphere, and the 'imagination-based cultus' in the spiritual word nearest to the Earth. These events involved the nine spiritual hierarchies, associating them with the karma of the anthroposophical movement. 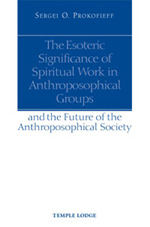 Prokofieff elaborates the tasks of the Anthroposophical Society and indicates how these are connected with the spiritual hierarchies, the Michael movement, the Grail mysteries, the work of new Group Souls, and the Foundation Stone Meditation. He shows that the General Anthroposophical Society was, in an esoteric sense, created in order that human beings might learn to work with the Gods themselves. This is a vital booklet for anybody who cares deeply about the future of the Anthroposophical Society, or the future of mankind itself. SERGEI O. PROKOFIEFF, born in Moscow in 1954, studied painting and art history at the Moscow School of Art. He encountered anthroposophy in his youth, and soon made the decision to devote his life to it. Since 1982 he has been active as an author and lecturer. In 1991 he co-founded the Anthroposophical Society in Russia, and since Easter 2001 he has been a member of the Executive Council of the General Anthroposophical Society in Dornach. This is his nineteenth book to appear in English translation.